Hello everybody, the Carpetbagger here, for the first time making a post from the road! I am currently in the great sunshine state of Florida, where I was hoping today to check a roadside attraction off my list: The notorious Spongeorama. 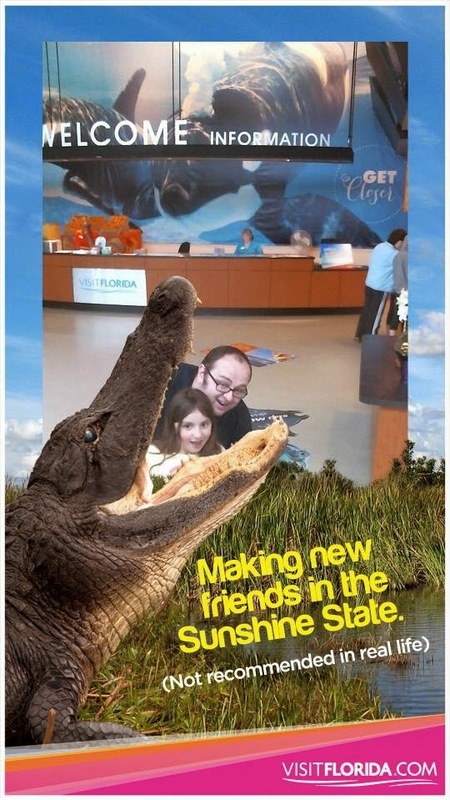 But first off, we partook in a family ritual.....The Florida Welcome Center. They had added some other tourist photo ops! Now then, Spongeorama has been near the top of my "list" for years, but I have never been able to manage to hit it. Spongearama always looked like an amazing stop to me. It was an oddly specific museum: The history of Sponge Harvesting, plus it had tons of creepy moldy old mannequins. This time we decided that we would drive an hour out of our way to finally see it. We drove through hellacious thunder storms and made it there a half an hour before closing. I was stoked. I saw a plywood cutout of a old timey diver beckoning me from an alley some some sort of 19th century pervert. Me and my daughter happily charged in to see the fabled museum. A lady stopped us at the door and squirted some foul "Sponge Lotion" into our hands. It was disgusting, but I happily rubbed it into my palms to be a sport. As we skipped back to the Sponge Museum the lady crushed my soul as she said, "Museum is closed". I looked at her in shock. She simply shrugged her shoulders and rolled her eyes. "When will it be open?" I asked. "Tomorrow" she said. Sadly, we were stay 1 1/2 hours away. "Museum is flooded" she said. Apparently, tomorrow there would be a scheduled unflooding. I moped out into the streets of Tarpon Springs a crushed a defeated man. With Spongeorama being a bust, I explored the streets of Tarpon Springs. Apparently, Tarpon Springs is a Greek Community in Florida. Their primary industry is sponge diving. In fact they actually erected a statue to the Sponge Diver in the center of town.